While many people place a lot of importance on brushing teeth, flossing is too often ignored and might be even more important. Not only can poor flossing habits cause dental issues, it can increase your risk to contract some very severe health issues. With that in mind, we are going to dive into why flossing is important, effective flossing practices, and some of the risks if you don’t include flossing in your daily routine. If you’re looking to improve your dental health, call us at Brandywine Smile Center to schedule an appointment. Dementia: 65 percent greater risk of developing if someone does not brush twice a day. Pneumonia: While good oral health can reduce your risk of pneumonia by around 40 percent, people with periodontitis are 300 percent more likely to contract it. While your diet is the biggest thing that determines oral and dental health, brushing and flossing have an impact that cannot be understated. With one-third of American adults admitting they never floss, they are putting themselves at greater risk of these health issues and other concerns. Wrap a piece of floss, around 15 to 18 inches long, around each of your index fingers. Slip the floss between your teeth and bring it around the side in a “C” shape. Move the floss up and down, back and forth, to scrub the area clean. Be sure you do this to both sides of the tooth before moving on to the next one. If your teeth are spaced out too much, try using a thicker floss. If you have trouble with dexterity, you can use a soft plaque remover, which allows you to clean your teeth with one hand. As you floss, you’ll notice definite signs of growing health issues. For instance, bloody gums is a clear sign that bacteria is causing damage within your mouth. That bacteria can then travel through your bloodstream to cause chronic inflammation in other areas of your body. The best thing you can do in this situation is floss gently and brush more often until your gums no longer bleed. However, if the bleeding continues for more than a week, you’ll need to contact your dentist. While a Waterpik seems like a good option, they can actually be much harder on your gums and cause further damage, though they can be helpful for patients with braces. 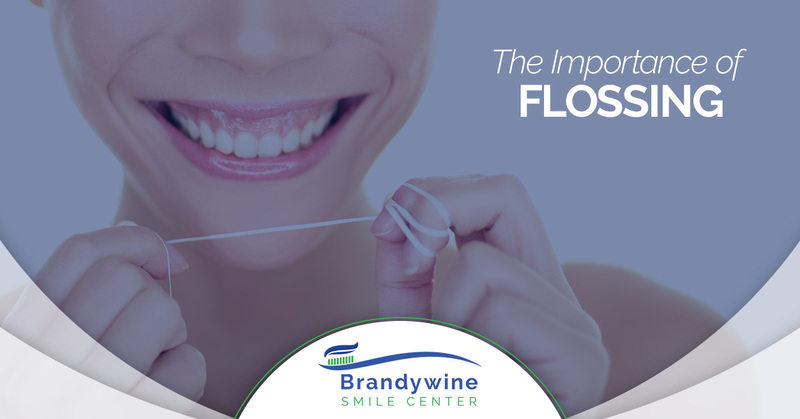 While flossing may not seem like an important piece of your overall health, the truth is it has a far greater impact than you would think. Follow these flossing practices and brush at least twice a day to help prevent serious health issues from developing. If you’re in Glen Mills and you’re looking to improve your oral health, call us at Brandywine Smile Center today to schedule an appointment. Whether it’s for a routine checkup or you need root canal treatment, our team of experienced and knowledgeable dentists will be able to help you get the smile you’ve dreamed of.